1988 - Architectural department of Novosibirsk Engineering Institute. 1995 - Historical Department of Novosibirsk State University (Diploma). 1995-96 - Decorative painting Department of Novosibirsk Fine Arts and Architectural Academy. Since 1997 - free-lance artist. Painting and graphics works are included in the art collections of Novosibirsk Arts Museum, House of Scientists of Siberian branch of Russian Academy of Sciences, private and state art collections in Russia, USA, Italy, UK, Israel, Greece, Belgium, Slovenia, Malta, Germany, Holland, France. Since 2001 is a member of International Federation of Artists and national Creative Union of Russian Artists. List of solo and group exhibitions. - Personal painting exhibition in the Marseille branch of the bank Societe Generale. - "Autumn Melody". Personal painting exhibition. - "Destination Soleil". Exhibition of four Slavic artists. - "Primus Tempus". Group exhibition of 30 contemporary artists. -Participated at the art competition "Sport in art". Winner (Diploma). Novosibirsk, Russia -international group painting exhibition "La Contea di Bormio", Bormio, Italy (Third Prize. Diploma). 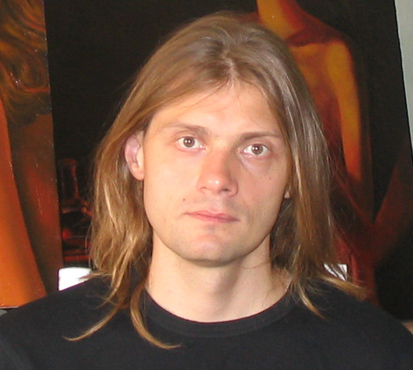 "Oleg Sheludyakov deserves the highest recommendation as artist and intellectual. He has been conspicuous on the Novosibirsk art scene for around ten years as painter, graphic artist, performance artist and filmmaker. In the art-armory of the young artist there are already several personal exhibitions, continuous participation in group exhibitions, and the participation in the Novosibirsk International Extra Short Film Festival (ESF). Oleg successfully exhibited abroad in Slovenia, Greece, Germany, Italy and Malta. The education he received at the Novosibirsk State University and at the Academy of the Architecture and Fine Arts, his strong aspiration for learning and self-development make Oleg one of the most interesting and intellectual artists of Novosibirsk. His open, communicative and tolerant personality allows him to adequately participate in Russian and International art projects." artist, the member of the Union of Artists of the Russian Federation. Director of the Autonomous non-governmental organization "Bureau of the Actual Culture," the curator of the project "New Palace of Culture," supported by the Ford Foundation, the Rector of the independent educational project "Department of the Modern Art".